ALIVE! Cafe's Head Chefs train for no fewer than 12 years at the world famous Soylent Green College. Only the choicest cuts of meat are used in the preparation of their dishes. ALIVE! is a popular themed fast food franchise with chains throughout Uruguay, Chile, Peru and Argentina. Based on the award winning film and TV series of the same name, it was founded in 1974 by Jeffrey Dahmer and Ed Gein (later of the Home Improvements Store - SKIN! ), with their first ALIVE! Cafe opening in Montevideo, Uruguay, where they began to cover the walls with related ephemera. Very popular among Rugby players. It is believed that many of the ideas propagated by the ALIVE! Group were later stolen by other companies, including McDonald's. 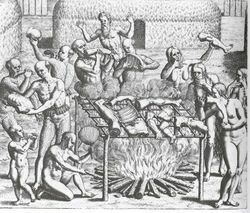 These include many of the meat processing techniques first developed by ALIVE! The Al Packer's cafe franchise was at one time the major market competitor for ALIVE!, but has since gone bankrupt, purchased by the Sara Lee Corporation on public auction, and converted to a health food chain in 1979. Since then, ALIVE! has enjoyed a virtual monopoly, with the exception of the Roadkill Cafe's occasional human-themed specials. In June 2004, the ALIVE! Group announced the setting up of an worldwide exportation of their food products. To deal with the rise in demand it is expected that the entire population of Columbia will be placed into cold storage to provide fillings for the next five years. In the restrooms, rather than the normal placards chastising employees to wash hands, there are signs directing them to wash all spare body parts. Reservations are made by weight rather than number. "Smoking or non" has a very different meaning. No successful lawsuits against ALIVE! have ever been filed for finding fingers in the chili. The UK restaurant chains Sweeny Todd's and Nilsen's Kitchen are not linked to the ALIVE! Group in any way. It is thought that the hit comedy Texas Chainsaw Massacre is based on the behind the scenes lives of the cooks and staff of an ALIVE! Cafe located near Dallas. This page was last edited on 29 May 2012, at 03:16.